Very glad to be in this lovely city again and an honour to be invited here. We are actually sad that the EU Presidency is over for your country, I would have been happy to find an excuse to come here more often. 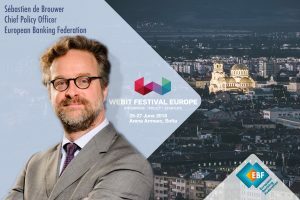 My name is Sébastien de Brouwer and I am the Chief Policy Officer at the European Banking Federation. Some people know us as the EBF. EBF represents banking associations from 32 countries, consisting of approximately 3500 banks. We represent our members towards political stakeholders, advocating for future-proof regulation. We do this in Brussels, home of many EU institutions and in Frankfurt, heart of the ECB and the Euro system. Since I am at a technology conference where the future is the main theme, I will not forget to touch upon that. But before looking ahead, I want to touch briefly on where the banking sector is coming from. The world of banking is naturally driven by innovation since the hay-days of finance. Through technology, banks found smarter ways to serve their customers, protecting assets, and automate administrative tasks. This was the case with ATMs, chipcards and interbank communication. All of which provide unique use cases for interconnected financial technology. Use cases where Europe was leading the way. But now we arrived at a time to keep on building on top these layers, constructing new things but with original values such as trust, security and growth. However, the grounds to build on today are quite complex, not only new technologies ask to be part of the system, also new players and new political forces challenge the unity of the financial sector in Europe. This unity finds a solid base in the form of an integrated Banking Union, Capital Markets Union and payments ecosystem post-PSD2. Eventually, these pillars should all be functioning within the EU’s Digital Single Market ambition. I want to highlight three types of decisions we collectively making as industry but also as believers in the single market of Europe. Three decisions regarding technology, regulation, business. Banks are now considered as the inevitable building block of the Digital Single Market and the sector is being empowered by innovative fintech companies that improve and automate all parts of the financial services chain. Big Tech, FinTech, BankTech; we are all contributors of the digital single market and a key driver of economic progress. Adoption of banking technology in inevitable, many established players are beyond experimenting and are integrating new tools where possible. The sector already embraced contactless payments, biometric authentication and fully autonomous automation through AI and machine learning. If this is already the reality. Imagine a couple of years from now. I am confident that our children will grow up with banking experiences that will be very different than we were used to. However, technology adoption remains challenging in a heavily regulated industry. It has to happen safely, without disturbing the system and creating more vulnerabilities. Cyber risk is also a reality. Millions can be lost by clicking on the wrong email. This brings me to the role of regulation. The normal order of things is that industries change, and rules are adapted accordingly. But what if we could anticipate the rules so that innovation is a natural result of it? Regulation should enable innovation, not hurdle it. Many legacy players in the sector are struggling with digital transformation, being heavily regulated since the beginning. We see that many current rules need to be adapted to the digital age, this is also where the EBF comes in. There is a specific issue in the way bank assets in Europe are valuated. An issue that is blocking the further digital transformation and growth of banks. Current prudential rules prescribe that the use of banking software is penalised instead of incentivised. Software is still valuated as an intangible asset, making it less worthy than basic office furniture. In other words, EU banking rules treat software as a cost rather than an investment. Unlike in the US, European banks are forced to cover expenditure on software solutions with the same amount of capital. This should be changed. We all know that software is way more than a simple add-on. It is a key operational component. The flows of digital data between market players is a space that needs to be watched closely. The financial infrastructure can be seen as a long chain of trust and should not be broken at once. PSD2 & GDPR are a good starting point for regulating the data age. The EBA Fintech Roadmap, the Commission’s Fintech Action Plan and especially the Cybersecurity Act are milestones we welcome and support. We look forward to engage with the authorities and provide industry input where needed. It is what the EBF likes the most. Technology provides unprecedented business opportunities. But innovating does not only mean investing in technology, but also in people. Just as with software, we humans have to be kept up-to-date as well. Because the skills and talent of those people working will ultimately decide the quality of banking services. Online and offline. The sector will also benefit from diversity. Diversity of skills and diversity of backgrounds. Especially in regions without legacy, digital services can flourish, and the market is empowered by very talented and progressive people. The Balkan region is a great example of this. Change leads to competition, which can be tough. But also can be healthy for the market and serve customer demand. Bank financing still feeds the economy, it is a basic ingredient for a growing society. But just as bakeries are not the only ones baking bread, banks will not be the only ones offering banking. The question for many banks is now: do they want to be the supermarket or the bakery? Or will they just provide the grains? In other words, the future of the banking industry depends on many things, not everyone will be able to cope with a new order. Banks will scale down, prosper or fade away. The way we interact with money will also change. Artificial Intelligence and the Internet of Things will play a big role in this. But for now, banks, policy makers and authorities will have to join forces and take action on many fronts to find a right balance between innovation, trust and security. I am not saying this is an easy task. Whatever the banking landscape may evolve into, in the end it is the end-user, European citizens like you and me, that must benefit from accessible, reliable and safe financial services across borders.